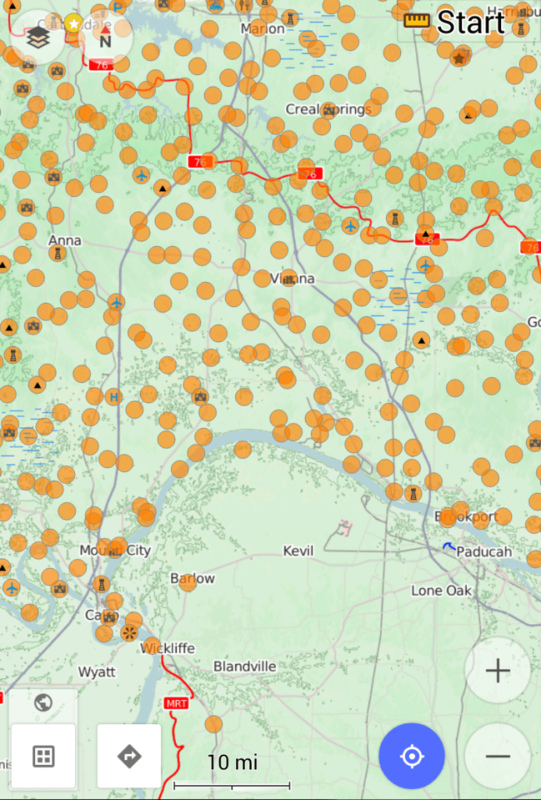 OsmAnd has great offline mapping features but it was tedious to ensure I had all of the maps at the desired zoom levels for the three-city bike ride in southern Illinois (pictured). My friend is going to pick up a unique bicycle in Ohio and ride it back to Chicago. He designed a good route on Google Maps but now he needs to save it to his smartphone so he doesn’t have to constantly load directions and use data and waste battery life. The best way to get a mobile view of the route is to use the Google Maps print feature and save it as a PDF. Then transfer that PDF to your phone through the Dropbox app. Then, in the Dropbox app, mark the PDF file as a favorite so that it’s stored offline, onto the phone. There’s probably an app that can do what he wants, but I don’t know about it. There are hundreds of “maps” apps to sort through in each the App Store for iOS and the Play Store for Android. In fact, I’ve downloaded OsmAnd, an offline maps app, for my Android tablet. I installed it and tried to learn how to use it in order to follow a downstate, intercity bike camping route. The app, though, required that you zoom in to each part of the map you wanted to store and then press “download”. I spent 30 minutes downloading parts of the map, manually panning to the next section, before I decided to instead obtain one of the Illinois Department of Transportation’s regional bike maps and just draw it on there and write out a “cue sheet” (turn by turn directions).